The right cardiac surgery. Right here. When it’s a stroke, minutes matter. Cleveland Clinic Indian River Hospital has the only interventional neurology program in Indian River County. Better together for the Treasure Coast. Indian River Medical Center is now part of Cleveland Clinic. 24/7 stroke care at Cleveland Clinic Indian River Hospital. Katherine Adams, M.D.Susan Agrama, M.D.Lilian Ahiable, M.D.Janet Anderson, M.D.Jason Appel, M.D.Lauren Applehof, D.O.Trevor Applehof, D.O.Shakoor Arain, M.D.Adam Armstead, M.D.William Arnold, M.D.Erol Atamer, M.D.John Atwater, M.D.John Atwell, M.D.Oana Badescu, M.D.Kathleen Baggett, M.D.Fredrick Baker, M.D.Seth Baker, D.O.Nancy Baker, M.D.W. Clark Beckett, M.D.Julie Bell, M.D.Xabier Beristain, M.D.Eric Berryman, D.O.James Betancourt, D.M.D.David Biezunski, M.D.Felix Bigay, M.D.Robert Bisset, M.D.Edgar Blecker, M.D.Lauren Bloom, D.O.Hassan Bokhari, M.D.Michael Bounassi, M.D.Hal Brown, M.D.Deborah Brown, M.D.Lindsey Bruce, M.D.Michael Burt, M.D.Robert Butler, M.D.Stuart Byer, M.D.Jennifer Byer, M.D.Timothy Caballes, D.P.M.Charles Callahan, M.D.Ashley Canipe, M.D.Charles Celano, M.D.Linda Chabrier, M.D.Tanveer Chaudhry, M.D.Nancy Cho, M.D.Luis Cisneros, M.D.Derrick Clunis, M.D.Franklin Cofresi, M.D.Jay Colella, M.D.Christopher Coppola, D.O.Harold Cordner, M.D.Seth Coren, M.D.Lilia Correa-Selm, M.D.Kristine Courty, D.O.Morgan Courty, D.O.Joseph Crawford, M.D.Kristy Crawford, D.O.Wayne Creelman, M.D.Curtis Dalili, M.D.Samantha Daniel, M.D.Hugo Davila, M.D.Ramiro Daza, M.D.Brian DeoNarine, M.D.F. Joseph Dermody, D.M.D.Carl DiLella, D.O.Raymond Duong, M.D.Alan Durkin, M.D.George Duvall, M.D.Charles Eberhart, M.D.Hassan Elhewan, M.D.Michael Eves, D.O.Brett Faulknier, D.O.Brendan Filardo, M.D.Charles Fischman, M.D.Desmond Fonji, D.O.Erin Forest, M.D.Jean Luc Franck, M.D.Richard Franco, M.D.Allen Friedenstab, M.D.George Fyffe, M.D.William Gallup, M.D.Alfonsina Garcia-Bracero, M.D.Jennifer Gerard, M.D.Ayman Gheith, M.D.Yakov Gitin, M.D.Arthur Glaser, M.D.Jonathan Glazer, M.D.Daniel Glotzer, M.D.Vikranth Gongidi, D.O.Alita Gonsalves Sikora, M.D.Mark Gonwa, M.D.James Gordon, M.D.Paul Graham, M.D.Brad Grasman, M.D.George Gray, D.O.James Grichnik, M.D.,Ph.D.Alan Grosset, M.D.Bruce Grossman, M.D.Jeffrey Grossman, M.D.Ashish Gupta, M.D.Vikas Gupta, M.D.Brett Haake, D.O.Lisa Hage, M.D.David Haile, D.P.M.Richard Handler, M.D.Ronald Hartnett, M.D.Paul Hebig, M.D.Leon Hendley, M.D.Robert Hendley, M.D.Neil Heskel, M.D.Guy Hickman, M.D.John Hoffman, M.D.John Holmes, M.D.Felicia Howard, D.O.Janet Hurlburt, M.D.David Hurst, M.D.Taher Husainy, M.D.Mushtaq Hussain, M.D.Omar Hussamy, M.D.Leslie Huszar, M.D.Jane Ierardi, M.D.Tim Ioannides, M.D.Paul Isenbarger, M.D.Salomon Israel, D.D.S.Raul Jimenez, M.D.Pramod Joseph, M.D.Peter Joyce, M.D.William Kane, M.D.Garrick Kantzler, M.D.Caroline Kedem, M.D.Alastair Kennedy, M.D.Arline Kenneth, M.D.Joshua Kieval, M.D.Collin Kitchell, M.D.Nikitas Kleopoulos, M.D.Larry Landsman, M.D.William Lasswell, M.D.Katrina Leshanski, D.O.Thomas Lewis, M.D.Marc Lieberman, M.D.John Lindenthal, M.D.Yunguang Liu, M.D.Jeffrey Livingston, M.D.Melvyn Lobo, M.D.Jimmy Lockhart, M.D.Alec Lui, M.D.Katharine Lum, M.D.Gregory MacKay, M.D.Charles Mackett, M.D.Michele Maholtz, M.D.Deni Malave-Huertas, M.D.Diego Maldonado, M.D.,FCCPMark Malias, M.D.Leonardo Mandina, M.D.Peter Marzano, M.D.Roy Mason, D.O.Michael Mazziotta, D.P.M.Marc McCain, M.D.Cristina McClure, D.O.John McDonald, M.D.William McGarry, M.D.Katherine McGraw, M.D.Caroline McKnight, D.O.Beatrice Memet, M.D.Noor Merchant, M.D.Jay Midwall, M.D.Fernando Miranda, M.D.George Mitchell, D.O.Eileen Monuszko, M.D.Richard Moore, M.D.Mauricio Munoz, M.D.Michael Munz, M.D.Edward Murphy, M.D.Susan Murphy, M.D.Helwey Mustafa, D.O.Heather Nagel, M.D.Su Naing, M.D.George Nichols, M.D.Guido Nodal, M.D.Phillip Nye, M.D.Michele Ofner, M.D.Monisola Oni, M.D.Iheonu Oriaku, M.D.Julio Pagan, M.D.Paul Pagnini, M.D.Joao Panattoni, M.D.Amberly Paradoa, D.P.M.Armando Pardillo, M.D.Ivana Parody, M.D.Stephen Patterson, M.D.Derek Paul, M.D.Richard Pechter, M.D.John Peden, M.D.Richard Penly, M.D.Theodore Perry, M.D.Arley Peter, M.D.John Petersen, M.D.Michael Phillips, M.D.Gerald Pierone, M.D.Craig Popp, M.D.Donald Portell, D.O.Gene Posca, M.D.James Presley, M.D.Marie Prinsen, M.D.George Puskar, M.D.Mary Quillinan, D.O.Angelica Quintero, D.O.Pranay Ramdev, M.D.Jessica Ramirez, M.D.Melissa Reynolds, M.D.Marion Richardson, M.D.Thomas Ridge, M.D.Stephen Ritter, M.D.Miguel Rivera, M.D.M. Nasir Rizwi, M.D.Fabio Roberti, M.D.Victor Rodriguez-Viera, M.D.Lisa Rogers, M.D.Ralph Rosato, M.D.Marc Rose, M.D.Roberta Rose, D.O.Alan Rosenbaum, M.D.Mark Rothenberg, M.D.Richard Rothman, M.D.Theodor Rudolph, M.D.Jeffrey Sacks, M.D.Harish Sadhwani, M.D.Rosana Salama Bello, M.D.Daniel Sanchez, M.D.John Sarbak, M.D.Dennis Saver, M.D.Cristiana Scridon, M.D.Tudor Scridon, M.D.Matjaz Sebenik, M.D.S. James Shafer, M.D.Asha Shah, M.D.Georgia Shapiro, M.D.Babar Shareef, M.D.Akram Shhadeh, M.D.Joshua Shipley, M.D.Muhammad Siddiqui, M.D.Kent Smillie, M.D.Molly Snell, Ph.D.Hardik Soni, M.D.Arthur Splendoria, M.D.Aisha Thomas St Cyr, M.D.William Stanton, M.D.Richard Steinfeld, M.D.Raul Storey, M.D.Cary Stowe, M.D.Ana Suarez, M.D.John Suen, M.D.Falguni Sura, M.D.Christopher Tardif, M.D.Umair Tariq, M.D.Ana Taveras Pantaleon, M.D.Ryan Taylor, D.O.Sung Taylor, D.O.Howard Tee, M.D.Robert Tobar, M.D.Michael Tonner, M.D.Thet Tun, M.D.Alice Ulhoa-Cintra, M.D.Guy Ulrich, M.D.Hermes Velasquez, M.D.Michael Venazio, M.D.Andre' Vendryes, M.D.Carlos Vizcarra, M.D.Patricia Walters, M.D.Anthony Ware, M.D.Samuel Watkins, M.D.Frederick Weeks, M.D.Margaret Weeks, M.D.Michael Wein, M.D.Laurie Welton, D.O.Lloyd Werk, M.D.Peter Wernicki, M.D.Martha Wheeley, M.D.Sarah Wittenrich, M.D.Geoffrey Wolf, M.D.Laura Wolf, M.D.Daniel Wubneh, D.O.Cathy Xu, M.D.Clarence Yates, M.D.Srinivas Yerneni, M.D.Alex Yoon, M.D.Joseph Zerega, M.D. Cleveland Clinic Indian River Hospital. 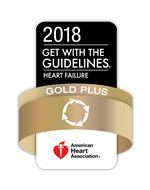 The Hospital received the American Heart Association’s Get with the Guidelines® Heart Failure Gold Plus Achievement Award. We are a Blue Distinction® Center+ for Cardiac and Knee/Hip Replacement Surgeries.